Sue Ten never ceases to amaze me. Just tonight she brought me a plate of piping hot waffle fries, fresh from The Swing Barn’s own organic Fry-O-Lighter. She assures me that these delicious crispy potatoes are full of vitamin C, and she hardly even winced when I sprinkled malt vinegar over the plate and dug in. As it turns out, confectioner’s sugar would have been just as good. I tell you, the woman has a gift for potatoes. Granted, I do have an ongoing dispute with her about potatoes masquerading as pie crust, but I will never turn down her potato-sausage-cabbage casserole, her potato-brocolli-cheese soup, or her potato-bacon frittata. They are all perfect beyond question. Just now, though, I’ve found out a little more about her love affair with The Spud. When her kids were in school, they all five, one after another, took on the daunting assignment of building a potato clock. I’m sure I remember seeing a kit for such a thing in the back of my brother’s copy of Boy’s Life, or Grit, or some such magazine, but I never attempted to assemble one of the things and had pretty much forgotten about the potato-as-battery concept. Sue Ten never forgot, however, not after helping what must have seemed like a neverending parade of frustrated middle-schoolers year after year re-create this particular piece of magic. Never one to waste hard-gained knowledge though, Sue Ten continued to tinker with the damn things long after all five of the little Tens had long since grown up and moved away, leaving Sue and her husband Logan with time on their hands and several empty rooms. Let me take a minute now and fill you in on potato-clock technology, Just in case you are one of those rare individuals who doesn’t know what a potato clock is. Yes, you might be, although that would be surprising. Even your second-cousin Darnell knows what one is, and Joe Sparkle Junior has been running one in the E-Z Cart so he knows what time it is when he’s out on the driving range picking up golf balls. I now have two in my turquoise conch cottage down at the end of the lane. “Potatoes, as we know, have power. ”Which of us . . . has not, at one time or another, taken two common galvanized nails, three alligator clip/wire units (that is, alligator clips connected to one another with wire), two short pieces of heavy copper wire, a simple low-voltage LED clock unit, and two potatoes, and obtained a simple LED clock unit that functions from the power of a 1- to 2-volt, button-type battery, opened the battery compartment to remove the battery, noted that there is a positive (+) and a negative (-) terminal point where the battery was installed , identified the potatoes as number one and number two, inserted one nail in each potato, inserted one short piece of heavy copper wire in each potato, placing it as far from the nail as possible, used one alligator clip/wire to connect the copper wire inserted in potato number one to the positive terminal in the clock unit, then used one alligator clip/wire to link the nail in potato number two to the negative terminal in the clock unit, used the final alligator clip/wire to link the nail in potato number one to the copper wire in potato number two, and finally, with no little sense of triumph, set the clock a-ticking? Indeed. 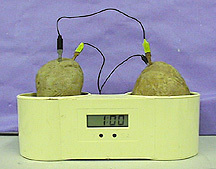 Heady stuff, I think controlling time with potatoes. There’s more to this particular story, though. I mentioned Sue’s husband, Logan Ten, an affable guy with gifts of his own, a man who would go into any town and find a free buffet or a public reception in a matter of hours. He was a man who had mastered the art of the two-for-one, and usually came out with three. Once Logan retired, though, he seemed content to collect his pension, and he began a peculiarly sedentary life of watching CNN 24-hours a day. During that time, though, Sue developed what can only be described as an obsession with potato-clock technology. Her timepieces became ever more efficient, and her potato batteries reached impossible levels of duration. This, I understand now, accounts for the great variety of potato dishes coming out of The Swing Barn kitchen. As Sue experimented with different strains of potatoes, she would buy spuds in quantity, and then cook up the leftovers after determining key factors such as longevity and quality of the best electrical charge. While all that was going on, my mother and her sisters were running the pie shop, the driving range was but a fantasy, and I was on an extended walkabout, looking for an honest man, but settling for Pretty Boy Boyd instead. By the time I returned to South Florida, no one had seen Logan for quite some time, but Sue Ten was behind the bar at The Swing Barn, smiling and chatting as usual. That night, as I walked down to my turquoise cottage, I looked back at the Tens’ doublewide behind The Swing Barn, and I noticed a warm glow coming from one of the bedroom windows. I knew Sue was still at the Swing Barn cleaning up, so I let my path diverge and headed north to see what was up. Standing on my toes, I could peek into the window, and there I saw Logan, propped up in bed, smiling just as I remembered him, eyes closed though, and beathing softly. The glow was coming from the television set broadcasting CNN, as well as from an array of aromatherapy candles. There was just enough light for me to notice that Logan had been outfitted with what appeared to be a couple of electrodes affixed to this temples. The main wires for the electrodes came from opening just above the bed’s elaborate headboard featuring a reproduction of some of the murals in the “happy house” in the ancient city of Pompeii. A container of blue bills was nearby on the nightstand. I moved silently to the next window and was stunned yet delighted to see shelf after shelf after shelf of potato batteries, some with clocks, some without, but all feeding into the network that was, apparently, keeping our dear Logan in his perpetually restful state. I don’t know what brought Sue and Logan to this junction, but I do know she does seem as happy now as she ever was. As for Logan, he may even look a little bit more relaxed than before. Yes, I think he is doing fine.